Toddler Approved! : How To Respond If Your Toddler Says "I Hate you"
How To Respond If Your Toddler Says "I Hate you"
A few months ago my toddler went through a phase where he was constantly saying "I hate you." My toddler has always been super sweet and lovey dovey so this new language was a bit surprising. Just like any annoying toddler phase like hitting, running away, or throwing things... I knew it would pass... but I also knew that how I reacted to what he said would determine how soon he would move through it. Today I'm going to share how I respond when my toddler says, "I hate you." Most toddlers don't actually know what they are saying when they say, "I hate you." They are just repeating a phrase that they've heard and often they've recognized that the phrase is a powerful one and gets a good reaction, so they repeat it. 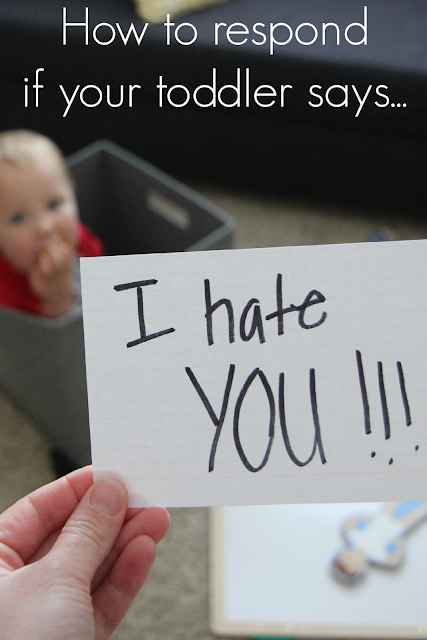 Here are the ways I respond when my toddler says, "I hate you." With any inapropriate language or negative language in our house, I try my best to ignore the words without ignoring my child. I stay calm and I don't react. I try not to take the bait and engage in a power struggle or an emotional conversation about the words. If I give too much attention to the words by saying "hate is a bad word" or react in a big or emotional way when he says it, my son will use the words more and more because he knows they are powerful and get a good reaction. I also try and encourage my older kids to ignore the toddler's words and focuses on other things... otherwise they reinforce the language even if I am ignoring it! Acknowledging emotions is my "go to" strategy for most toddler challenges, especially tantrums. Instead of responding to the words "I hate you," I try and respond more to the emotions behind the words. For example, if I won't let my toddler ride his bike and he says "I hate you," then I'll respond and say, "I can tell you are upset (or mad)! You want to ride your bike. We can ride bikes after we have dinner (or whatever the plan is)." Acknowledging feelings often just stops some of those big emotions from bubbling over and exploding. I don't get into an argument saying, "You know you don't hate me" or "that's not true." If my toddler is just upset in general over nothing specific and chooses to say, "I hate you" as his reaction, I will just focus on giving support and then typically redirect or move onto doing something else. By focusing on the feeling words instead of "hate" I take a bit of the attention off of that word. I always try and respond to "I hate you" by saying, "I still love you" or "I will always love you, even when you are mad at me." Instead of repeating the word "hate," I try and give my kids additional words to use to express themselves that are more descriptive and express their emotions a little bit better. Often giving kids the appropriate words to explain how they are feeling can help them share their feelings better. As you practice this you will find your child uses more accurate language instead of just using hurtful "I hate yous"! When all else fails, just remember that it is just a stage and your toddler will move through it! 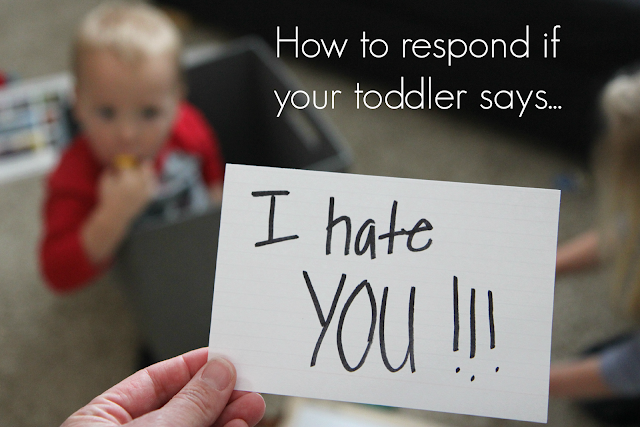 Do you have any other ways you respond to a toddler who says, "I hate you?" I cried lol. Probably not the best strategy. I always respond with "I love you no matter what!" My daughter said for the first time very recently. I just ignored it. Next time I'll try to focus on discussing with her her feelings at that time. It is so hard to hear those words from your child. I usually tell them, "I'm sorry to hear that. But I will always love you, no matter what you say or do." Then I let them go calm down.